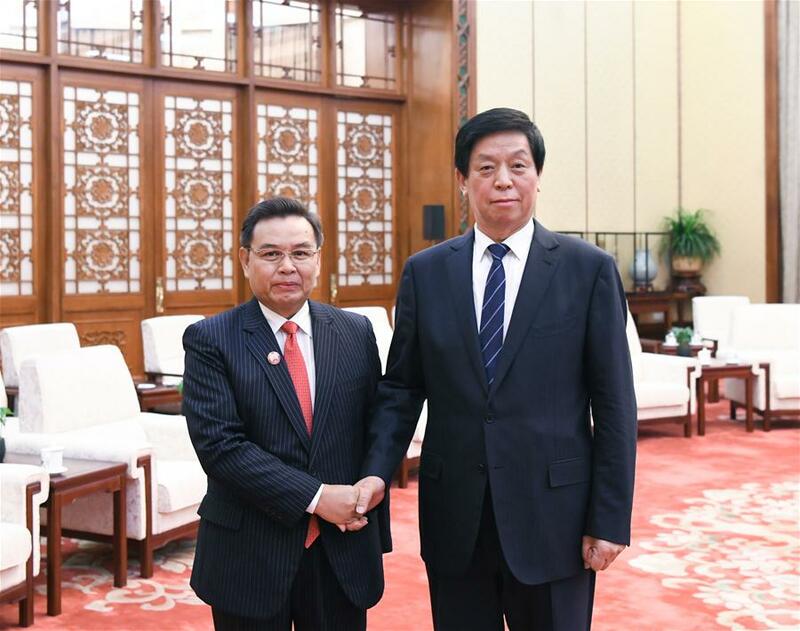 BEIJING, March 19 (Xinhua) -- Li Zhanshu, chairman of the Standing Committee of the National People's Congress (NPC), on Tuesday met with Xaysomphone Phomvihane, president of the Lao Front for National Construction. Hailing that China and Laos are "good neighbors, friends, comrades and partners," Li said China attaches great importance to ties with Laos and stands ready to work together with the country to promote the Belt and Road cooperation guided by the consensus reached by top leaders of both governing parties and countries. The NPC is willing to intensify exchanges with the Lao legislative body to provide legal guarantees for bilateral friendly ties and lift the ties to a new level, said Li. Xaysomphone said Laos is ready to build a Laos-China community with a shared future, adding that he believes the Belt and Road cooperation will inject strong impetus into the development of Laos and benefit both countries and peoples.